Rainbow Loom Patterns is run by people dedicated to helping you create great-looking patterns, find Rainbow Loom Kits when you get low and feature some great video tutorials on those hard-to-get Rainbow Loom Patterns. The popularity of Rainbow Loom is enormous, so much so, that the manufacturers have run out of supplies! We hope this site will serve as a one-stop digital resource to help you create intricate designs for you and your friends. As news, patterns and information are announced about Rainbow Loom, we will help spread the word and get the information out there for you to know. If you would like to join the conversation, feel free to like our Facebook Page and participate! I need written instructions on how to make the different patterns of the rainbow looms. Hi! I LOVE rainbow loom but at my home I can’t access youtube! The only website that works is this website called tudou.com. 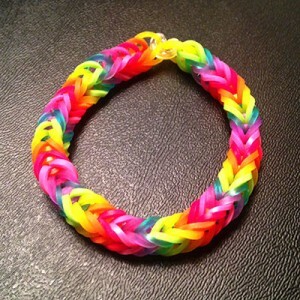 I hope you can post some rainbow loom tutorials so then I can make bracelets again! Thanks a lot! I know lots of them like the zippy chain , heart,double x, fishtail,raindrop,starburst,ladder,triple,bow tie,tulip tower,colbra,and the inverted fishtail.You can look all of the bracelets up on youtube.You can also look up charms.Have fun!!!!!!!!! Type in rainbow loom bracelets and type in what kind of bracelet you want then you can pick the video and wala!!!!! Have fun!!!!! I need written patterns and not just videos. On the “Star Ring” I couldn’t even do it because it was so dark. I lllloooooooovvvvveeeeeeee the rainbow loom!!!!!! I work at a Convent and the Sisters do not have access to computers to watch your videos. Can you tell me where we can get written instructions on how to make your bracelets.